Join Blue Whale Lagoon Resort in a surf camp in tropical Sri Lanka! This surf camp is a perfect getaway for you who want to experience something new. There are several activities that you can do when you are tired of surfing. Blue Whale Lagoon Resort and their crew will make sure that you get a memorable holiday in Sri Lanka. The sounds of Indian Ocean waves will make your mind at ease and enjoy every bit of your holiday without any worries! You will stay for this surf holiday at the Blue Whale Lagoon Resort which is a charming four-cabana and a single room resort. The resort takes its name from the magnificent sea creatures spotted in the waters here. Blue Whale is a passionate group of people driven by the desire to share the beauty and warmth of Sri Lanka with people from all over the world. They will make your holiday even more perfect with their warm, from-the-heart service, personalized for every guest. The resort is 10 minutes walk to the closest beach. At the resort, every guest is special. Everyone who walks into their little cabana is special and is treated as such. Blue Whale also loves nature and will do nothing to destroy it. Monitor lizards come to sunbathe on their lawns and kingfishers flit about their coconut trees. They love animals and you are welcome to bring your pets. Blue Whale Lagoon Resort can tailor your surf camp experience to suit your needs. Experienced instructors will guide the new beginners while their in-house guide knows where to find the best waves for the advanced surfers. Blue Whale is located near some of the best surf points in southern Sri Lanka. The resort is the perfect surf camp base for both beginners and experienced surfers. They will arrange everything, so you can enjoy the surfing and then come home to Blue Whale to rest and relax in total comfort. 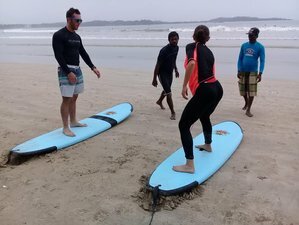 Surf lessons will be held on the beaches in Cabalana or Weligama where the lessons will be conducted in groups or individually according to your preference. During this surf camp, you will get one free excursion. You can choose from a catamaran ride through the backwaters or a trip to unspoiled Koggala Lake. This surf camp will take place at Blue Whale Lagoon Resort villa in Ahangama, a serene, unspoiled corner of southwestern Sri Lanka, known for its bewitching beauty and laid-back pace of life. The resort is set in a green expanse of coconut palms and tropical blooms, fringed by the clear, blue waters of the Indian Ocean. The ocean laps at your feet and the soothing susurrus of waves is all the noise you'll hear. Sunbath on their private lawn, surrounded by a lagoon in the company of birds and monkeys chattering in the trees surrounding the property. The resort is 10 minutes walk to the closest beach. Please book your flight to arrive at Bandaranaike International Airport (CMB). Transfer from this airport is available upon request at 60 USD per person per trip. The trip takes around two until three hours on the expressway depending on traffic. If you decide to hire your transportation, please make sure to agree on the price in advance. Airport: Bandaranaike International Airport Airport transfer available: Bandaranaike International Airport (US$60 per person) Additional charges may apply. You can request this in the next step. Blue Whale strives to make each stay memorable, whilst offering the best possible surfing experiences, with free transport to the best surf points in the area.